In the world of cuisine, street food is the latest and hippest, a ready-to-eat style sold on the fly by a hawker, cheaper than that found in restaurants and something you can usually consumed with just your fingers. Instant gratification–all the flavors are there in one bite. Like street food, street sports emerged from the proletariat fringe and are immediately accessible with their rogue brand and flavor. They are available to anyone anytime, an instant high for urban athletes and bystanders and fertile ground where unorthodox trends have emerged. “Volta” is Cirque du Soleil’s 19th production in San Francisco and gets much of its inspiration from street sports and culture, from the fringe fashionable and the soon to be ordinary. The cast is energetic and buff, young people taking selfies on LED lit cell phones as they march around the stage like urban soldiers paying little attention to who or what is around them, totally submerged into their devices. Sound familiar? Perhaps too familiar from the cirque that we expect to transport us to other worlds and magical places. This fraction of the cast is called the “Greys” and is contrasted by a burning-man-like sect called “Freespirts.” Clad in rainbow-colored stylized hippie drag, these nonconformists have nonetheless conformed to their own standards and ultimately offer little contrast between the two groups. “Volta” is loosely written and tightly directed by Bastien Alexandre, whose thin narrative about a young man finding himself relies heavily on cliché, pitching to the current generation and less to “children of all ages.” The story is ultimately unnecessary thanks to the spectacular athleticism and aptitude of its performers, all who have fit bodies and joker-like-smiles. 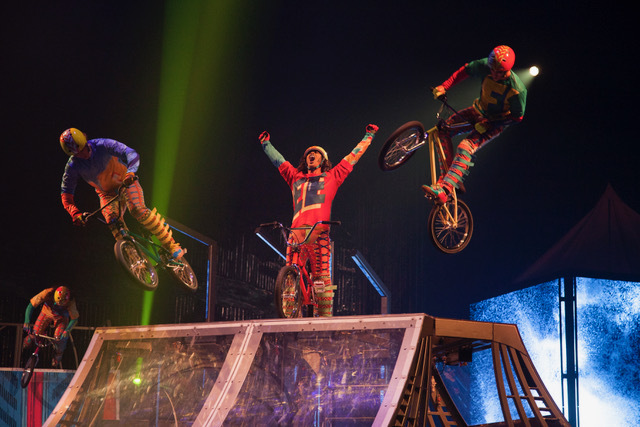 These entertainers are multitalented enough to flirt with the front row while balancing on a BMX, suspended from aerial straps, bouncing off trampolines, or while dangling from bungees. They include a contemporary clown (Andrey Kislitsin) with self-possessed washing machines that have an attitude, a boasting stud on a unicycle (Philippe Bélanger) balancing Marie-Lee Guilbert effortlessly on his head, and pair of identical twins (Kevin Atherton and Andrew Atherton) on duo straps. As these twins soar through space they create an illusion of one person that splits into two. They also usher in that old school element of oddity and eccentricity that circuses were known for, to an otherwise very uniformed, albeit multi racial and international cast. The highlight of Act I is its closing, “Rise & Shine,” a trampoline segment where the “Freespirits” playfully and effortlessly bounce up to and through a two-story structure before diving off and jumping back again. It’s a one, two, three, person dive and bounce back that keeps raising the stakes until all seven acrobats are crisscrossing each other in midair, catapulting directly through second story windows to the other side. Act II opens mystically with a “hair suspension” feat with Brazilian aerialist Danlla Bim who levitates miraculously from a rig tied to her hair. Suspended in a lotus position at first, she then floats like a goddess above the stage, darting back and forth through space until eventually spinning like a cyclone to the top of the tent, energetically taking the audience with her. It’s hard not to imagine that there isn’t something attaching her to this floor to ceiling rope other than her hair. Her hands float freely as she sails around like a real-life Tinker Bell. The show ends with an all-out BMX park as daredevil riders rambunctiously perform life-threatening air tricks, leaping and spinning their bikes on ramps to the customary overproduced soundtrack. There was a time not so long ago, when street sports like BMX and circus arts weren’t so commonplace. A time when we truly needed a big tent to witness the unusual, when aerial performances weren’t apart of dance and theater events, a circus on the outskirts of town was a mysterious venue. This was before circus acts were staged in Las Vegas theaters. Despite how this form of entertainment has become less difficult to find and unusual to witness, “Volta” remains the obvious attraction to add to your holiday events list. To take advantage of the video montages and to hear the singer and master of ceremonies more clearly, purchase seats more center stage, avoiding those to the far sides. “Volta” runs through February 3rd.